These mole bitters fromBittermens make me want to make a million chocolate Manhattans. These Valentines are amazing.Blue eggshave arrived! I'm going to be making SO MANY EGG THINGS this weekend. This is a pink well pinked in meringue form. And blood orange curd. Vegetarian Ventures lives in my head. Love, Bake, Nourish by Amber Rose is filling my brain with magical cakes covered in cream and fruit and flowers. Reading thisbook of poetry by Cecilia Llompart feels like jumping into an ice bath full of frozen roses, immediately followed by moon gazing in a hot spring. And dear god this grapefruit raspberry flourless torteis gorgeous. Then some truffle beauty via Beth of Local Milk. YEAH! Heat a large cast iron pan over medium flame. 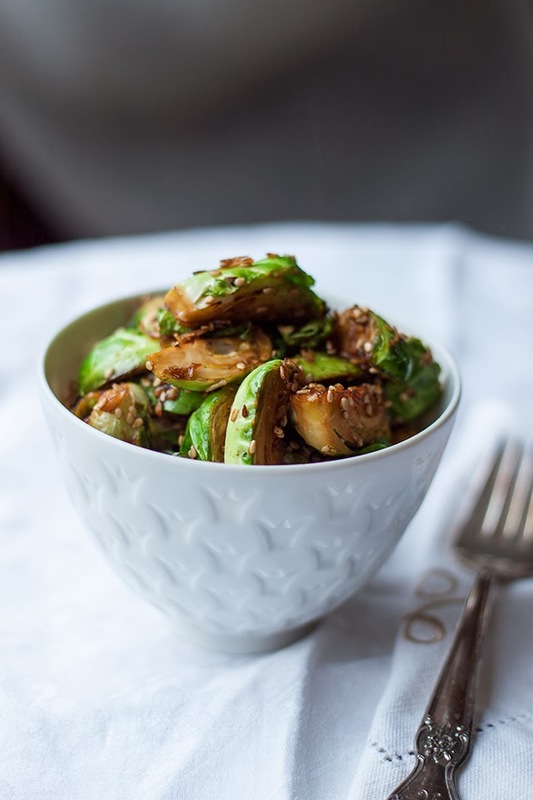 Once good and hot, add brussel sprouts. Let cook 5 minutes (they'll start getting a bit brown). Add tamari, and cook 10 minutes more (I added a top at this point to let it steam). Add honey, sesame seeds, and coconut flakes and cook 2 minutes more, until caramelized. Remove from heat and serve. Place a poached egg on top, and enjoy!